The Boiler Room bundle is unlocked after you have completed two other bundles. The bundles in the boiler room focus on your mining skills. Below you will find everything that you need to complete all three bundles in the boiler room bundle and where to find those items. - Copper Bar: You can get the copper bar by smelting the copper ore into the furnace. - Iron Bar: You can get the iron bar by smelting the iron ore into the furnace and by crafting “transmute “FE” recipe. - Gold Bar: You can get the gold bar by smelting the gold ore into the furnace and by crafting transmute “AU” recipe. Once you have all of the items mentioned above, you will complete the blacksmith’s bundle, and you will be awarded with a Furnace. - Quartz: In order to get the quartz, you will need to forage on all levels of mines. - Earth Crystal: To get the earth crystal, you will have to forage on the levels between 1 and 39 of the mines. 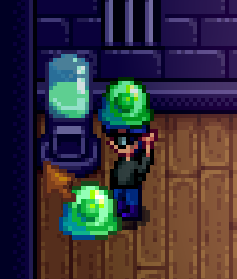 You can also find it inside the Geodes. Moreover, the earth crystals can be dropped from the dust sprites between the floors 40 and 80 in the mines. - Frozen Tear: Can be found by foraging on the levels between 40 and 79 of mines. Can also be found in the frozen Geodes or can be dropped from the dust sprites in the floors between 40 and 80 of mines. - Fire Quartz: You can find the fire quartz between the levels 80 and 120 of mines. Can also be found in Omni Geode and Magma Geode. 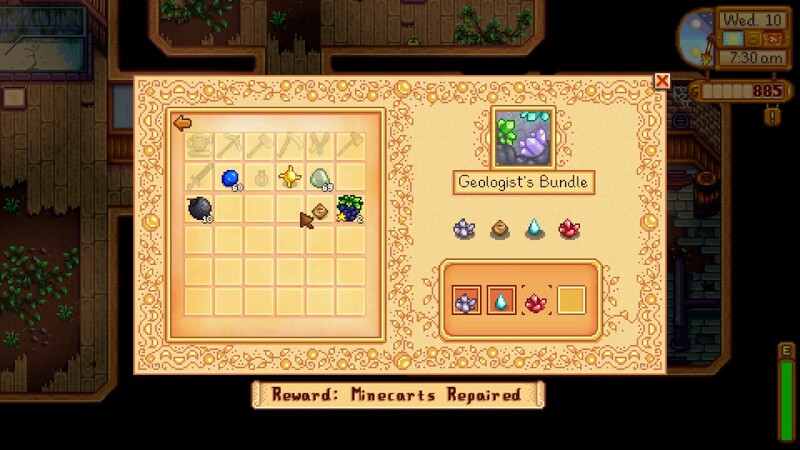 Once you have collected all of the above-mentioned items, you will complete the Geologist’s bundle and you will also get five Omni Geodes as a reward. - Slime: You will need 99 slime that can only be dropped by the Slimes. - Bat Wing: You will need 10 bat wings that are dropped by the bats in mines. - Solar Essence: The solar essence can be found in mines where the ghosts, metalheads and squid kids drop it. Also, the mummies in skull cavern drop the solar essence as well. - Void Essence: You can get the void essence in the mines as it is dropped by shadow brutes. 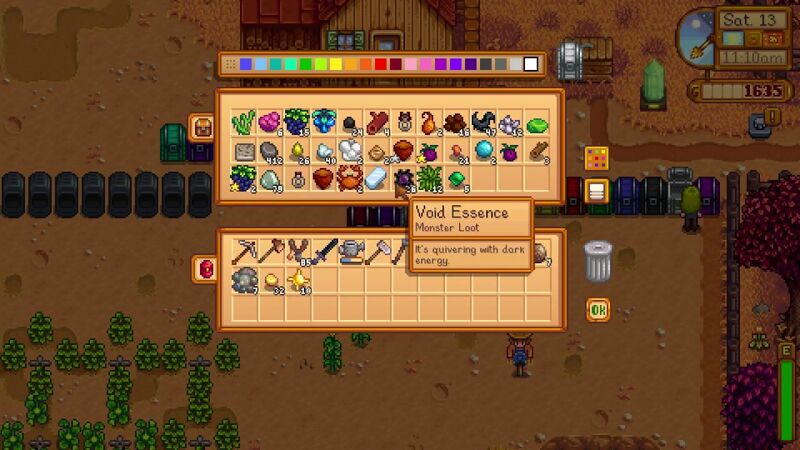 Also, the serpents in skull cavern drop the void essence as well. Once you have all of these items, the Adventurer’s bundle will be completed and you will get a small magnet ring as a reward. 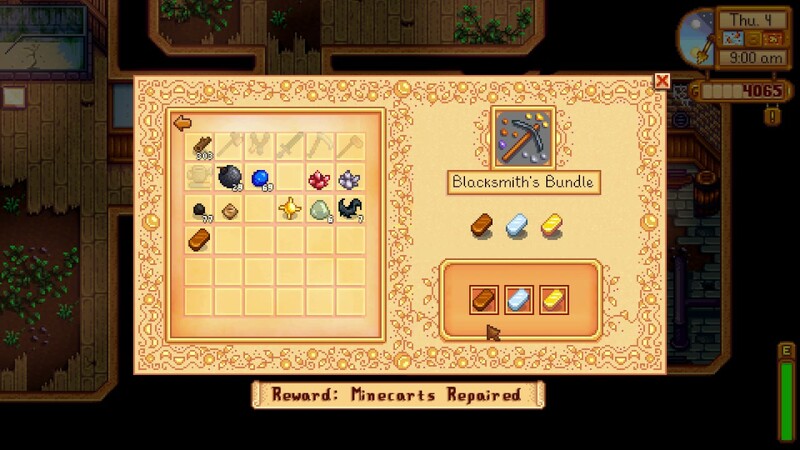 After you have completed all of the above-given bundles, the Juminos will repair the mine carts at the bus stop, mines and besides blacksmith. You can then use them to travel between all of the three areas quickly.